Since the company was founded in 1848, Omega has pioneered a huge range of innovations. Britain’s Royal Flying Corps chose Omega watches in 1917 as official timekeepers for its pilots and again in 1940, RAF Pilots watches were supplied by Omega. The 40s also saw the first tourbillon wristwatch and the first of the famous Seamaster watches, whilst the ’50s and ’60s introduced the legendary Constellation, Speedmaster, Seamaster 300 and Railmaster. Over these years, everyone from John F Kennedy to Elvis wore Omega watches on official duties. What’s more, in 1962, astronaut Wally Schirra took his Omega Speedmaster to space on NASA’s Mercury Sigma 7 mission, and in 1969 two Omega Speedmasters landed on the moon, worn by Neil Armstrong and Buzz Aldrin. The Omega Constellation is an iconic timepiece, having been in continuous production since 1952 and one which has always represented Omega’s most luxurious precision chronometer timepiece. When launched, and throughout the ’50s and ’60s, the Constellation was a much more prestigious and expensive piece than the equivalent Rolex Oyster Perpetual and contained a far better movement. Finding a nice vintage Constellation is not all that hard, but finding a special, early Constellation is very hard. It has a stunning solid gold dial and has an immaculate 35mm case along with a spectacular Cal.354 bumper movement. Most examples are firmly locked inside collections of devotees to the vintage brand and model, therefore this is a Constellation that should not be missed. This rarest of Pie Pan dials, made in solid gold, radiates a restrained luxury rarely seen in contemporary watches. It exudes special high quality and taste, without over-flamboyance and while remaining a true design icon. The dial is beautifully balanced with applied yellow gold hour indices, unique to this model, which are matched with original yellow gold Dauphine hands. Also unique to this model is the applied Omega brand, signature and star, each made in solid gold. The dial has been restored to the highest standards by our dial restorers which are generally considered to be the best in the UK. The original Omega Calibre 354, 17 Jewels, Chronometer grade movement, designed by Charles Perregaux, is a true classic, which has certainly stood the test of time. The bumper uses an oscillating weight that winds in one direction. Over 1.3 million of these movements were produced between 1943 and 1955 and it was very carefully designed for chronometer level accuracy while remaining robust enough to handle to handle the strong vibrations caused by the hammer action. This movement is still going strong on the wrists of countless owners of early automatic Seamaster and Constellation watches. Including this, over half a million Calibre 354 movements were certified as ‘Chronometers’. The movement has just been fully overhauled and serviced by our watchmaker. This involves fully dismantling the movement to all its components, ultrasonic cleaning of all the parts, inspection of all the critical surfaces under high magnification and replacement as required with genuine new original parts. Next, careful reassembly and oiling, using all the correct lubricants to manufacturer’s specification before final testing and calibration. This watch is therefore now running, winding and setting perfectly, having been calibrated and timed at +7 seconds per day! Please note, this timing is outstanding for any watch of this age. The watch movement also has an excellent 42-hr power reserve. We are therefore more than happy to provide our 12 months’ warranty on this watch*. The movement is signed Omega Watch Co, Swiss, Adjusted to five positions and temperatures, 17 Jewels and carries the calibre number 354, along with the serial number 14,133,571 which dates manufacture of this watch to 1954. As mentioned above, Omega Constellations from the 1950s are rare and this Deluxe example is rarest. The 35mm Omega Swiss made-case is of exceedingly high quality with a beautifully designed profile and lugs. All the lines and edges are well defined, indicating the watch has been very well cared for. The case-back is also very distinct, again indicating this watch has seen little use. The case-back, bezel and case body are all in beautiful condition with no scratches, dings or other damage visible to the naked eye. The watch has been lightly used and very carefully looked after, which has meant that after careful inspection, the case has simply required a professional clean and gentle hand-polish to bring back the almost new look of the watch! As can be seen, the inside of the case-back is signed Omega Watch Co., Swiss Made, with Geneva Swiss 18ct hallmarks. 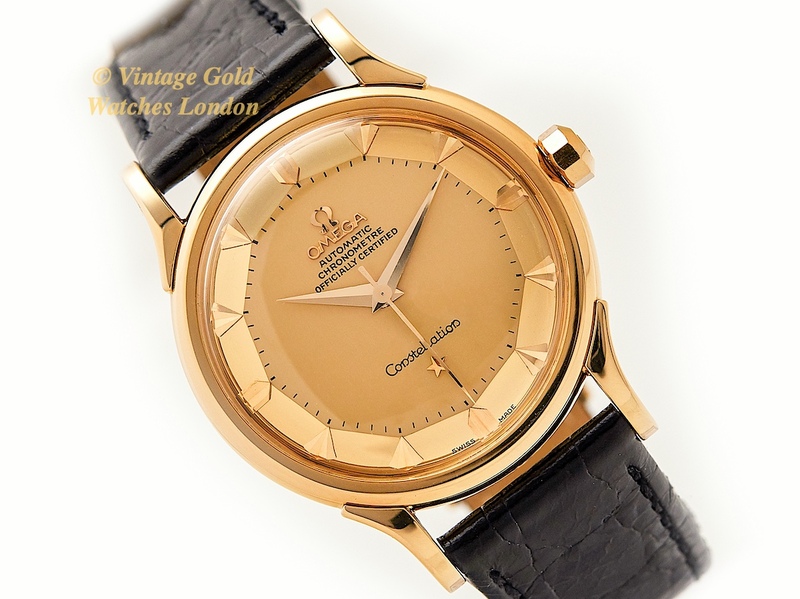 It also carries the case number 11419672 and the Omega model number 2648 / 2700 SC. The watch has been fitted with a new high quality, Black Crocodile strap and gold plated Omega buckle. However, if a different colour or style of strap is preferred, please let us know and we will do our best to oblige, free of charge. We carry tan, conker, dark brown burgundy and black straps in stock, in plain, padded leather, alligator, crocodile or lizard skin. Although there are no original papers with this watch, the reference numbers, markings, signatures, and hallmarks are all correct, dating the watch to 1954. Detailed particulars will be included with the receipt, along with our 12 months warranty*. A separate insurance valuation for the replacement value of this watch will also be provided at the time of sale along with our unique ‘Lifetime Authenticity Guarantee’ which states: “If this watch proves to be anything less than totally authentic, or not as described, Vintage Gold Watches of London will offer you a full refund at any time”. The watch comes complete with its original Omega Constellation presentation box as shown in the photographs. This is a wonderful first series Omega Constellation Deluxe dress watch, which is in immaculate condition and incredibly rare – certainly outside of a museum or private collection. Prices of bumper movement gold Constellations are already climbing to £5,000 when they can be found, and so the list price of this much rarer Deluxe model is very realistic. A word on our prices – We always try our hardest to acquire the very highest quality watches we can find, before then restoring them to the highest possible standards. We then offer these at the fairest prices we can, taking into account our pre and post sales care and service. This approach means we will never be the cheapest, but nor will we be the most expensive. Indeed there are some well-known stores in West London which are highly successful charging between two to three times the price you see here. We, therefore, consider our prices to be fair, given the quality of watches we have to offer. We are happy to accept payment via PayPal as this is the quickest method of payment. However, if you would like to pay by UK cheque or by bank transfer, we will be pleased to assist you with this and pass on a 3% saving to you. Similarly, if you wish to pay by International SWIFT or Bank Wire Transfer we will provide you with our BIC / Swift number and our IBAN number. Please note, we also welcome part exchanges. Also outright purchases of similar watches. We will also offer Watch Service, Watch Repairs & Watch Restoration, please see here.